They say, when you see a great idea you immediately think, "Of course! Why didn't I think of that?" 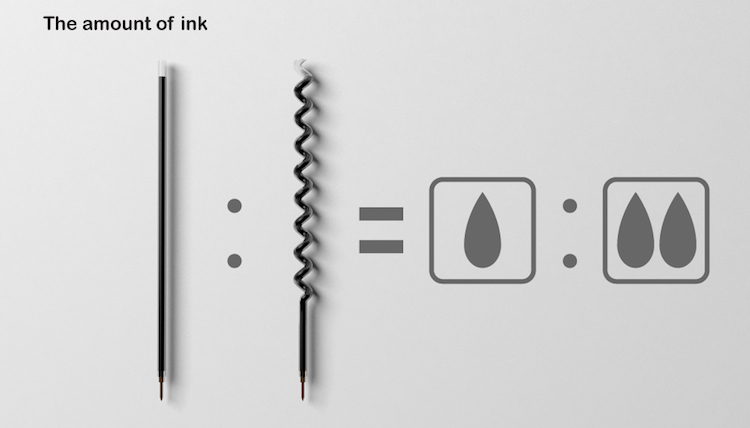 Such is the case when seeing this corkscrew ink tube that doubles your ballpoint pen’s ink. I immediately thought that's obvious. Then I thought, "I'm sure I've seen this before." I know I've opened a pen that I had purchased in the UK or Europe that has had this shape of ink well, because I remember wondering why it was that shape and where the hell was I going to find a replacement. The reason no one has done this before is obvious. Bic isn't selling you a pen, they are selling you an ink delivery product. If you can keep your pen for twice as long, you'll buy half as many pens. My guess is, the folks at Bic or Papermate have done the number crunching and decided selling less of something made no sense. I hope this does get picked up but I have a feeling it won't despite it's obvious rational.